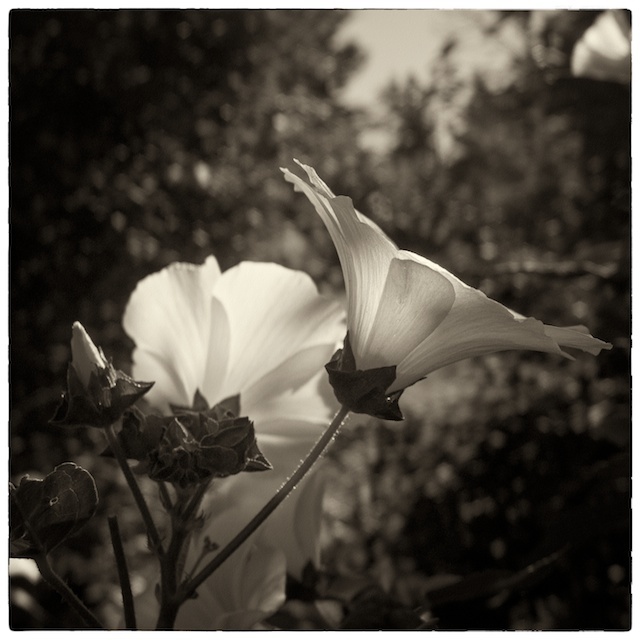 I started this blog with the idea that it would be a medium for some idle musings, some reflections on some of the random topics that attract my attention. Maybe the odd book review when something really grabbed me and deserved a little verbal leg up. Then, not even a month after my modest entry into the wold of blogging, life has inserted its own stubborn editorial prerogative. I have crashed, head on, into a brick wall. The wall you see here is a memorial remnant to mark the location where a major hospital that was deemed redundant was collapsed in a most spectacular implosion. The government orchestrated the event in a zest to balance the books with total disregard for the awkward fact that that people do get sick. 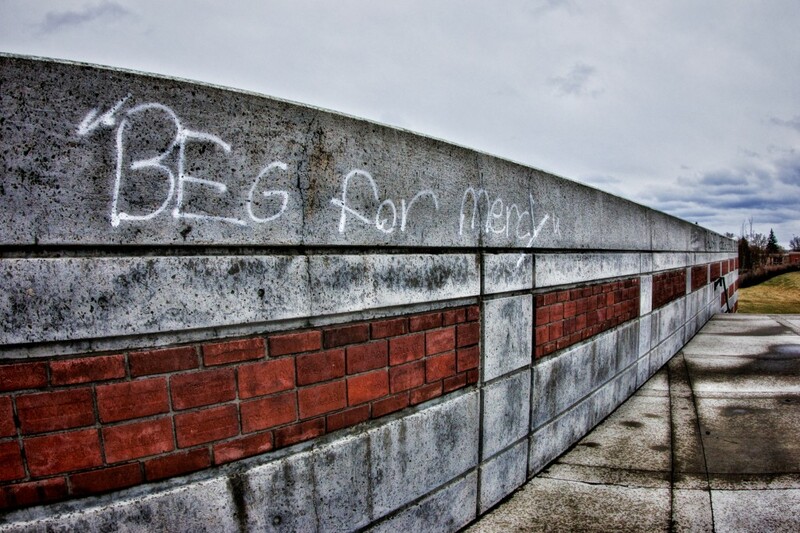 I took this photograph two years ago simply as an artistic statement. Then last week I allowed an illness I have long lived with to bring me to the brink of hospitalization. I have bipolar disorder. It’s not a secret and I rarely give it a second thought. Diagnosed after a most spectacular manic break in my mid-30s I responded well to medication and never looked back. To appreciate the genesis of this recent setback one has to look back a good year and a half. For nine years I have worked with small not-for-profit agency serving adults with brain injuries. I have loved my job. We help people accessing benefits, advocate for services, and adjust to the sudden impact that severe injury brings to the survivor and their families and friends. But lately there had been something out of sorts. The Executive Director began forgetting to issue invoices and pay bills. His behaviour became increasingly erratic and unpredictable. As the senior management staff member my workload multiplied as I sought to cover his shortcomings and meanwhile, on behalf of the staff, I had to try to encourage the Board of Directors to issue at least some kind of thorough review. Instead they paid him out, congratulated themselves on a job well done and left it to myself and another key staff to fill in the gaps. With such an increasingly unmanageable forest of papers and emails threatening to bury me alive I brought work home and worked through the evenings and weekends. Sleep all but evaporated and soon I was, well, running on high octane. And not in a good way. The realization that I was on the doorstop of mania was a shock when I discovered my empty pill case. I had been stable for 18 years. Under medical advice I have requested stress leave but it has become clear that the mental health stigma is alive and well. Of course it doesn’t help that as my mood escalated my behaviour began to appear increasingly bizarre. I can’t take that back, but such is the illness. Consequently I have been referred to as unstable, unreliable, incompetent. It is unlikely that a return will be feasible. As the longest serving staff member, my heart and soul were bound to the vision of this agency. At this moment, my ghost is not only roughed up, but fractured. And I am not even a strong believer in a soul but there is some soul-shaped hole in my heart right now. Will mental illness ever be understood as an illness of the body like any other? 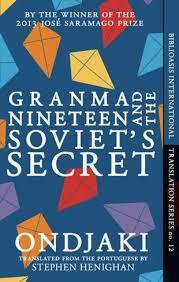 Last week I had the pleasure of reading Granma Nineteen and the Soviet’s Secret by the young Angolan author Ondjaki. This exuberant, magical tale re-imagines a dramatic event set in the community of Bishop’s Beach in the city of Luanda in the early years of Angolan Independence. The country’s first President, Agostinho Neto, has died and a curious, threatening project is rising on the beach. The Soviets are constructing a Mausoleum to the deceased President and, it is rumoured, the surrounding neighbourhood is scheduled to be demolished. Our unnamed narrator is a young boy who lives with his grandmother in a community where a cluster of eccentric granmas are important and valued elders. Together with his friends Pi (known as 3.14) and Charlita, he embarks on a mission to save the day drawing on a worldview informed by spy movies, Spaghetti Westerns and Portuguese language soap operas. A colourful cast of supporting adults round out their adventure including Comrade Gas Jockey who mans a station with no fuel, crazy Sea Foam who is rumoured to have a pet alligator, the Cuban doctor Rafael KnockKnock and a Soviet official christened Gudafterov by the children as a result of his awkward use of the local language. I learned of this book through the CBC radio program Ideas. In this extended interview, recorded live at the Blue Metropolis Festival in Montreal this spring, Ondjaki spoke of his childhood from which so much of this fantastic tale is derived. He insisted that in his early years, the socialist presence was simply a fact of life – they had a lack of electricity and running water – but it was normal and his childhood was happy. He talked with infectious enthusiasm about his family, his very early introduction to literature and fondness for Marquez, and the deeply ingrained understanding of the magical in the reality of everyday life in cultural mindset of his homeland. Within the week I had obtained and read the book. The tale was every bit as engaging and entertaining as I had expected. But the greatest find for me personally is the small Canadian publishing house Biblioasis behind Granma Nineteen and the Soviet’s Secret. This book belongs to their small and select series of books in translation. Although he is recognized as one of the rising stars of African literature, Ondjaki’s work is not widely available in English to date. Biblioasis has published two of his novels, both translated by Stephen Henighan. I am very impressed by the results. A work like this depends so heavily on playing with language. Puns and intentional misrepresentations that work in Portuguese have to be re-imagined to work well in English and fortunately the translator was able to work closely with the author to bring the work to life with all its magical energy intact. As a Canadian I am embarrassed that I am only just discovering Biblioasis. I definitely intend to explore more of their offerings, both in their international series and in their English language Canadian titles. Many years ago I promised myself that someday – someday – I would write. But first I would need to live more, explore more, expand my world so that I would have experiences to draw from. And I would have to read, widely, to learn from the masters. So I set out to live and I continued to read. The life I have been living has not been the one I imagined. It has been at once more ordinary and more weird that I have ever could have expected. Yet when I think about writing about my own experiences, I am no longer certain just how much I am comfortable sharing. And the more I read, the less confident I am about my own capacity to commit words to page. Has reading humbled those ambitions of my much younger self?